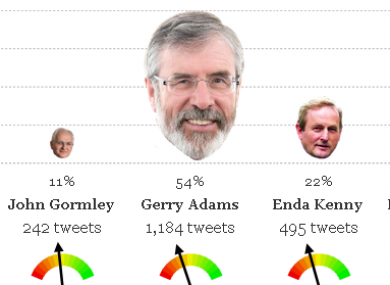 TheJournal.ie’s Twitter Tracker now tracks sentiment – and shows that all five parties were bemoaned during RTÉ’s debate. ALL FIVE PARTIES were spoken of in mostly negative terms during last night’s RTÉ debate between the leaders of all five main parties, according to TheJournal.ie’s Twitter Tracker. The tracker, which now also tracks the sentiment of tweets posted about parties in real-time, shows that the tweets being posted by users relating to all five of the main political parties were mostly negative during the time that their five leaders were on air. Labour came out worst, the tracker indicates, with the most heavily negative volume of tweets, while Fine Gael’s sentiment was the most relatively positive of all five parties. The tracker does indicate, however, that of all tweets posted in the last 24 hours, those related to Eamon Gilmore were positive on the whole. Of the five party leaders, only Gilmore can boast of more positive tweets than negative ones, while Micheál Martin is the worst-performing of the leaders, with tweets about him being more negative than those about any of the other leaders. Gerry Adams was, by far, the most mentioned leader of the five – with tweets discussing him posted more frequently than those relating to the other leaders put together. Email “Twitter debate reaction negative to all five parties”. Feedback on “Twitter debate reaction negative to all five parties”.